Today's Throwback Thursday review turns back the calendar to May 2010 and my first book by an author who has since become one of my favorites. 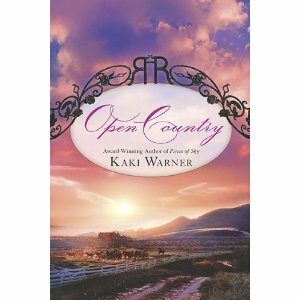 With Home by Morning, the final book in Kaki Warner's Heartbreak Creek series, being released in July, I thought this would be a good time to re-post my thoughts on Open Country, the book that began my love affair with this award-winning author's work. Molly McFarlane is as desperate as a woman can get – even one alone on the frontier. Forced to flee with her late sister’s children, she must provide for her wards while outrunning the relentless trackers their vicious stepfather has set on her trail. To secure their future, she marries a badly injured man, assuming that when he dies his insurance settlement will provide all they need. But there is one small problem. Since she was thirteen years old, Molly McFarlane has been assisting her famous surgeon father in the care of Civil War soldiers and taking care of herself. She’s never had a social life, never been courted by a young man and now, at twenty-six, she finds herself on the run with two young children. Far from their Georgia home, they are lucky to escape serious injury when the train on which they’re riding derails in Texas. Desperate for money to keep the children safe, when Molly hears that the train company will pay the families of the dead $300, she pretends to be the fiancé of a fellow train passenger who is seriously injured and not expected to survive and, when they won’t pay a fiancé, she convinces the local minister to marry them, even though the groom is unconscious. But, when she realizes that there’s a chance the man might live, and the only doctor in town is a drunk who’s convinced he’ll die, her conscience and her many years of nursing won’t let her walk away. Hank Wilkins is a complex, quiet man. He’s content to run the family ranch with his brother, Brady and visit the local brothel when he needs “attention.” Having his heart smashed to pieces by a fickle woman has destroyed his trust and he has no interest in giving love, or marriage, a second chance. Following the train crash in which he is almost killed, Hank awakens with amnesia, his only memory the sweet, southern voice of a woman who says she’s his wife. Who the hell was Henry? Her voice was familiar, but her face was only a blue. He tried to remember, but the effort sent him sliding back toward the void. Terror thundered through him. “Don’t go,” he choked out as blackness pressed against the edges of his vision. He felt her hand on his cheek, her palm cool and soft against his skin. Her touch was his lifeline, her voice his beacon. In desperation, he clung to it with all of his mind as the smothering darkness sucked him under. Feeling guilty for what she’s done, Molly tells Hank’s brother, Brady, that she will have her marriage to Hank annulled but while Brady doesn’t trust Molly, he quickly realizes that she’s his brother’s best chance of survival. Not only that, but he’s terrified that his pregnant wife will have complications as she did with her last pregnancy so he convinces (blackmails) Molly to travel with them to their remote family ranch and stay until Hank is healed and Jessica has safely delivered their baby. Grasping the opportunity to keep the children safe, Molly accepts, never expecting to fall in love, not only with Hank but with his entire family. While Hank and Molly have plenty of life experience, when it comes to love and romance, they are both as awkward as newborn chicks, as is evidenced in the following two internal monologues as they each contemplate the rituals of courting. It was starting to sound less fun by the minute. He didn’t like courting. He didn’t know how to act or what to say, and the one time he’d tried it – other than with Molly, apparently – he’d felt big and awkward and clumsy. So much easier if he could just say, “We’re married. Take off your clothes.” Neat and simple. He glanced at her, wondering if he should give it a try. Just as well. He wasn’t feeling that perky. Courting. What did that mean, exactly? What was she supposed to do? Did she even have the proper clothes? It was ludicrous, really, that at the spinsterish age of twenty-six all those adolescent yearnings and doubts should grip her so strongly. Would he recite poetry? Tell her she was beautiful? The notion almost made her laugh. Romantic words from the man who had wrestled her over a chamber pot? Not likely. As time passes and Molly and Hank grow closer, they both learn to open themselves to the possibility of love and trust between them. Molly yearns to truly belong to this man…this family…this beautiful but unforgiving land. But with the secret of their sham marriage, the knowledge that Hank’s memory could return at any moment and a madman closing in for the kill, the question becomes not whether Hank will forgive her and love and accept her as his wife but if any of them will live long enough to see tomorrow. I loved this story! Kaki Warner grabbed me from the opening of the book and never let me go. Even now, days after turning the final page, I’m still thinking about the characters from this intensely emotional and realistic frontier story. Not just Molly and Hank, but the whole family. I came to care about all of them and hope to see them again in the next book in this series. The secondary characters in Open Country are a colorful cast and very important to the story, especially Molly’s niece and nephew. The scenes between six-year-old Penny and “papa-Hank” are some of the best in the book and had me laughing uproariously in some and wiping away tears in others. Fans of Warner’s first book, Pieces of Sky will be delighted to discover that Brady, Jessica and their children are featured prominently in Open Country. Several friends recommended that I read Kaki Warner’s debut novel, Pieces of Sky, when it was released in January. I haven’t found the time to read it yet but, now that I’ve finished her second book, Open Country, I’ll be correcting that oversight as soon as possible. Warner is a fresh new voice in historical romance who, through her vivid descriptions, compelling characters and smoothly flowing prose, brings the American Western frontier, with all its harshness and beauty, to life. I highly recommend Open Country! Have you read Kaki Warner yet? Do you have a favorite among her books? Do you enjoy historical stories set in the American West? Home by Morning is on my "highly anticipated" summer reading list. What new books are you looking forward to this summer? I'm afraid I've not read her but historicals of any kind are my favorite and there always seems to be new ones coming out all the time that I want to read! Catslady, she's an exceptional talent. Her 2009 debut, Pieces of Sky won the RITA and three subsequent books have been finalists for the prestigious award. I love that her books are character driven and filled with a wonderful depth of emotion. For maximum enjoyment, I recommend reading her books in order. For her debut trilogy, that would be Pieces of Sky, Open Country and Chasing the Sun. If you want to begin with her current series (which ends with her upcoming July book), then I'd recommend beginning with Heartbreak Creek. Whichever way you go, you have some awesome reading ahead! Give them a go, jcp. She's fabulous! I love historical novels set in the American West since they are captivating and set during a fascinating era and an interesting locale. Warner does a great job of "setting the scene" for the reader. I have read one of Kaki's memorable novels which are an escape to another place, era and are unforgettable. The American West in Olde is the ultimate experience. That is why I made a road trip to Colo. one summer and loved every minute of it. I love the old west too, petite and I think Warner does an exceptional job of capturing it. I really enjoy historical westerns, but I haven't read one by Kaki...yet! I highly recommend giving her books a try, Cheryl! I really liked this one, but I liked Pieces of Sky better. I haven't started this series yet, but have been waiting on the release of the last one. She is one of my favorite historical western authors. Her books are solid. Well worth the time. Never read her but now I want to! I really enjoyed the Runaway Brides series and have most of the others on my Nook. I'm looking forward to her newest book, but I'm also looking forward to reading her earlier books. Don't know why I've waited so long. I loved Kaki's Blood Rose Trilogy, it was awesome. Love her books and can't wait to read more. I enjoy her books. She gives such a good sense of place and has such well developed characters. This sounds like it will be another good one. I look forward to reading it. Review - - "Christmas Eve: A Love Story"